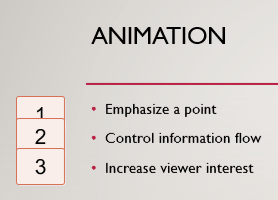 Animation is a great way to emphasize a point, control information flow, and increase viewer interest. Tap the slide that will have the animation. Select a line or block of text, picture, or graphic, and then tap Animations. On your phone, tap the Edit icon , tap Home, and then tap Animations. Choose the type of animation; for example, tap Entrance Effects. Choose the effect that you want to add; for example, tap Fly In. A number appears to indicate that an animation is present. You can add multiple animations to an item; for example, you can add an entrance animation and an exit animation. If you add multiple animations, the number that indicates an animation will change to indicate multiple animations. (Optional) To specify how you want a series of animations to appear (for example, if you are animating a bullet list), tap the number on the left side of the item, and then tap Effect Options Property. Depending on the type of animations you are using, you can choose the direction and sequence of the animations. Go to the next slide to add more animations. 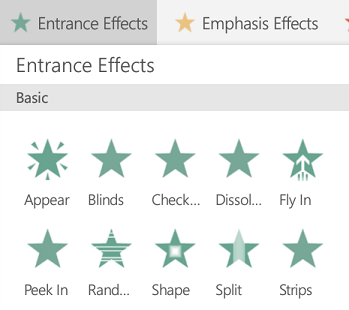 The PowerPoint app for Android contains a subset of the effects provided in the full version available with an Office 365 subscription. However, if you used the full version of PowerPoint to add any of the effects not provided by the mobile version, you can play them back on your Android device. Go to the slide that contains the animation that you want to remove. Select the line or block of text, picture, or graphic that has the animation. You will see a number or series of numbers on the left side of the item you selected. Double-tap the number, and then tap Delete. 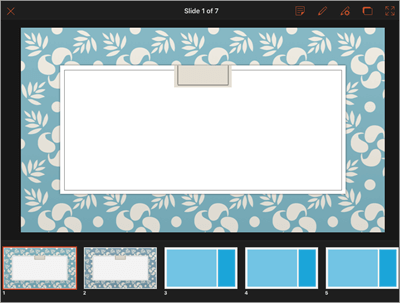 Tap the slide show icon to start your presentation. Flick left to go to the next slide (or slide animation), or flick right to go to the previous one. To zoom in or out on a slide, you can either pinch your fingers together on the screen, or stretch them apart. To exit the show, on your Android tablet, tap the top of your screen, and then tap End Show. On your Android phone, tap the End Show icon at the top of your screen . On your iPhone, tap the Edit icon , tap Home, and then tap Animations. (Optional) To specify how you want a series of animations to appear (for example, if you are animating a bullet list), tap the number on the left side of the item, and then tap Effect Options. Depending on the type of animations you are using, you can choose the direction and sequence of the animations. 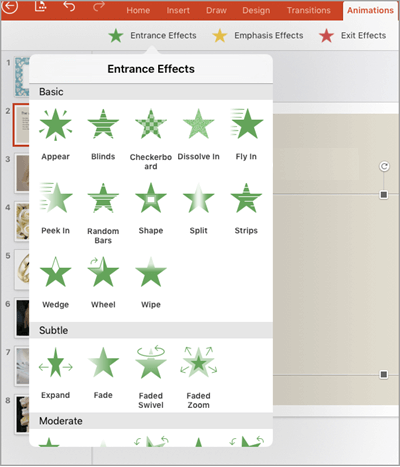 The PowerPoint app for the iPad or iPhone contains a subset of the effects provided in the full version available with an Office 365 subscription. However, if you used the full version of PowerPoint to add any of the effects not provided by the mobile version, you can play them back on your iPad or iPhone. To go to a specific slide, tap the icon in the upper right corner of your slide show . The slides will appear in order at the bottom of your screen. Flick left to move through the slides, and then tap the slide that you want to go to. To exit the slide show, tap the top of your screen, and then tap the x in the upper left corner. To exit the show, tap the top of your screen, and then tap End Show. On your Windows phone, tap the End Show icon at the top of your screen . On a Windows tablet or phone, you can’t use the PowerPoint app to add animations to or remove animations from a presentation; however, you can play back animations that you added previously with another version of PowerPoint. You can't add sound effects or motion paths to animations in PowerPoint on mobile devices at this time. In PowerPoint, animations are not the same as transitions. An animation affects a single slide. A transition animates the way one slide changes to the next. For information about adding and removing transitions, go to Add transition effects to your PowerPoint presentation with your mobile device.